By Patrick van der Valk Practical help for CEO’s and Leaders in SME’s. Over 20 years of marketing, science, and technology experience in San Francisco, London, and Lisbon. Available to buy from Amazon here. 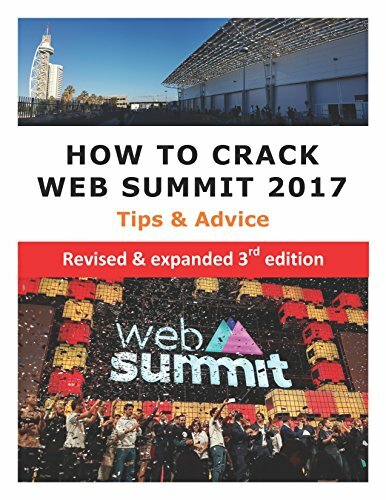 Simon’s latest updated version of ‘How to …..’ is a must-have guide if you aim to make the most of your time in Lisbon at this year’s latest version of the all singing, all dancing WebSummit. 2017 will mark the second year it is in Lisbon, or Lisboa to the locals. It is a beautiful, old, fantastic city, and with a recovering economy, the great weather, and a good location in the former Expo ’98 area it seems to be a good fit for a tech startup event that aims to seemingly add another 10,000 attendees every year. Well it had certainly outgrown Dublin, and as with all developing children, there are always growing pains. Last year’s event more or less came off well, give or take some oversubscribed events, including the opening gala, but it delivered in style in some aspects compared to its previous location. Because of the expansion, Simon’s book is so valuable. There is simply no way you can experience all of the WebSummit. Planning becomes a must. This new edition of the book has been completely re-written, updated, and expanded, and comes in at 3000 words longer than the previous edition. The overall goal remains to offer help and value, as you try to make sure you have a productive experience at something that grows and grows yearly. The challenge of course is that while growth is good for the Web Summit itself, it makes the experience for those attending more complex. This guide will help you to ensure that the WebSummit is a valuable experience for you. It is an Irish American Express: Don’t leave home without it!